For the 1779 French invasion, see Capture of Grenada (1779). Operation Urgent Fury, was a 1983 United States-led invasion of Grenada, a Caribbean island nation with a population of about 91,000 located 100 miles (160 km) north of Venezuela, that resulted in a U.S. victory within a matter of weeks. Triggered by a bloody military coup which had ousted a four-year revolutionary government, the invasion resulted in a restoration of constitutional government. Media outside the U.S. covered the invasion in a negative outlook despite the OAS request for intervention (on the request of the U.S. government), Soviet and Cuban presence on the island and the presence of American medical students at the True Blue Medical Facility. Grenada gained independence from the United Kingdom in 1974. The leftist New Jewel Movement seized power in a coup in 1979, suspending the constitution. After a 1983 internal power struggle ended with the deposition and murder of revolutionary Prime Minister Maurice Bishop, the invasion began early on 25 October 1983, just two days and several hours after the bombing of the U.S. Marine barracks in Beirut (early 23 October Beirut time). The U.S. Army's Rapid Deployment Force (1st, 2nd Ranger Battalions and 82nd Airborne Division Paratroopers), U.S. Marines, U.S. Army Delta Force and U.S. Navy SEALs and other combined forces comprised the 7,600 troops from the United States, Jamaica, and members of the Regional Security System (RSS) defeated Grenadian resistance after a low-altitude airborne assault by the 75th Rangers on Point Salines Airport on the southern end of the island while a Marine helicopter and amphibious landing occurred on the northern end at Pearl's Airfield shortly afterward. The military government of Hudson Austin was deposed and replaced by a government appointed by Governor-General Paul Scoon until elections were held in 1984. While the invasion enjoyed broad public support in the United States, and received support from some sectors in Grenada from local groups who viewed the post-coup regime as illegitimate, it was criticized by the United Kingdom, Canada, and the United Nations General Assembly, which condemned it as "a flagrant violation of international law". The U.S. awarded more than 5,000 medals for merit and valor. The date of the invasion is now a national holiday in Grenada, called Thanksgiving Day, and the Point Salines International Airport was renamed in honor of Prime Minister Maurice Bishop. The invasion highlighted issues with communication and coordination between the branches of the United States military, contributing to investigations and sweeping changes, in the form of the Goldwater–Nichols Act and other reorganizations. Sir Eric Gairy had led Grenada to independence from the United Kingdom in 1974. His term in office coincided with civil strife in Grenada. The political environment was highly charged and although Gairy – head of the Grenada United Labour Party – claimed victory in the general election of 1976, the opposition did not accept the result as legitimate. The civil strife took the form of street violence between Gairy's private army, the Mongoose Gang, and gangs organized by the New Jewel Movement (NJM). In the late 1970s, the NJM began planning to overthrow the government. Party members began to receive military training outside of Grenada. On 13 March 1979 while Gairy was out of the country, the NJM – led by Maurice Bishop – launched an armed revolution and overthrew the government, establishing the People's Revolutionary Government. On 14 October 1983, a party faction led by Deputy Prime Minister Bernard Coard seized power. Bishop was placed under house arrest. Mass protests against the action led to Bishop escaping detention and reasserting his authority as the head of the government. Bishop was eventually captured and murdered along with several government officials loyal to him. The army under Hudson Austin then stepped in and formed a military council to rule the country. The Governor-General, Paul Scoon, was placed under house arrest. The army announced a four-day total curfew where anyone seen on the streets would be subject to summary execution. The Organization of Eastern Caribbean States (OECS), as well as the nations of Barbados and Jamaica, appealed to the United States for assistance. According to a reporter for The New York Times, this formal appeal was at the request of the U.S. government, which had already decided to take military action. U.S. officials cited the murder of Bishop and general political instability in a country near U.S. borders, as well as the presence of U.S. medical students at St. George's University, as reasons for military action. The reporter also claimed that the latter reason was cited in order to gain public support. :1, 57 It was later revealed that Grenada's Governor-General, Sir Paul Scoon, had requested the invasion through secret diplomatic channels. Scoon was well within his rights to take this action under the reserve powers vested in the Crown. 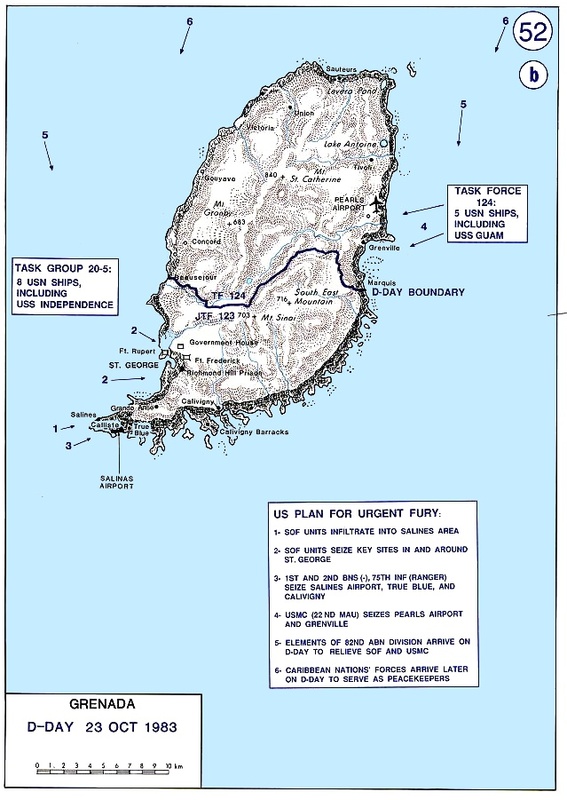 On 25 October, Grenada was invaded by the combined forces of the United States and the Regional Security System (RSS) based in Barbados, in an operation codenamed Operation Urgent Fury. The U.S. stated this was done at the request of the prime ministers of Barbados and Dominica, Tom Adams and Dame Eugenia Charles, respectively. Nonetheless, the invasion was highly criticised by the governments in Canada, Trinidad and Tobago, and the United Kingdom. The United Nations General Assembly condemned it as "a flagrant violation of international law" by a vote of 108 in favour to 9, with 27 abstentions. The United Nations Security Council considered a similar resolution, which failed to pass when vetoed by the United States. The Bishop government began constructing the Point Salines International Airport with the help of Britain, Cuba, Libya, Algeria, and other nations. The airport had been first proposed by the British government in 1954, when Grenada was still a British colony. It had been designed by Canadians, underwritten by the British government, and partly built by a London firm. The U.S. government accused Grenada of constructing facilities to aid a Soviet-Cuban military build-up in the Caribbean based upon the 9,000 ft length, which could accommodate the largest Soviet aircraft like the An-12, An-22 and the An-124, which would enhance the Soviet and Cuban transportation of weapons to Central American insurgents and expand Soviet regional influence. Bishop’s government claimed that the airport was built to accommodate commercial aircraft carrying tourists, pointing out that such jets could not land at Pearl's Airstrip on the island’s north end (5,200 ft) and couldn't be expanded because its runway abutted a mountain and the ocean at the other end. ...based on my personal observations, discussion and analysis of the new international airport under construction in Grenada, it is my conclusion that this project is specifically now and has always been for the purpose of economic development and is not for military use.... It is my thought that it is absurd, patronizing and totally unwarranted for the United States Government to charge that this airport poses a military threat to the United States’ national security. In March 1983, U.S President Ronald Reagan began issuing warnings about the threat posed to the United States and the Caribbean by the "Soviet-Cuban militarization" of the Caribbean as evidenced by the excessively long airplane runway being built, as well as intelligence sources indicating increased Soviet interest in the island. He said that the 9,000-foot (2,700 m) runway and the numerous fuel storage tanks were unnecessary for commercial flights, and that evidence pointed that the airport was to become a Cuban-Soviet forward military airbase. The invasion, which commenced at 05:00 on 25 October 1983, began when forces refuelled and departed from the Grantley Adams International Airport on the nearby Caribbean island of Barbados before daybreak en route to Grenada. It was the first major operation conducted by the U.S. military since the Vietnam War. Vice Admiral Joseph Metcalf, III, Commander Second Fleet, was the overall commander of U.S. forces, designated Joint Task Force 120, which included elements of each military service and multiple special operations units. Fighting continued for several days and the total number of U.S. troops reached some 7,000 along with 300 troops from the OAS. The invading forces encountered about 1,500 Grenadian soldiers and about 700 Cubans. According to journalist Bob Woodward in his book Veil, the supposed captured "military advisers" from the aforementioned countries were actually accredited diplomats and included their dependents. None took any actual part in the fighting. Some of the "construction workers" were actually a detachment of Cuban Military Special Forces and combat engineers. Official U.S. sources state that some of the defenders were well-prepared, well-positioned and put up stubborn resistance, to the extent that the U.S. called in two battalions of reinforcements on the evening of 26 October. The total naval and air superiority of the coalition forces – including helicopter gunships and naval gunfire support – overwhelmed the local forces. A month after the invasion, Time magazine described it as having "broad popular support". A congressional study group concluded that the invasion had been justified, as most members felt that U.S. students at the university near a contested runway could have been taken hostage as U.S. diplomats in Iran had been four years previously. The group's report caused House Speaker Tip O'Neill to change his position on the issue from opposition to support. By a vote of 108 in favour to 9 (Antigua and Barbuda, Barbados, Dominica, El Salvador, Israel, Jamaica, Saint Lucia, Saint Vincent and the Grenadines, and the United States) voting against, with 27 abstentions, the United Nations General Assembly adopted General Assembly Resolution 38/7 which "deeply deplores the armed intervention in Grenada, which constitutes a flagrant violation of international law and of the independence, sovereignty and territorial integrity of that State". The government of China termed the United States intervention an outright act of hegemonism. The USSR government observed that Grenada had for a long time been the object of United States threats, that the invasion violated international law, and that no small nation not to the liking of the United States would find itself safe if the aggression against Grenada was not rebuffed. The governments of some countries stated that the United States intervention was a return to the era of barbarism. The governments of other countries said the United States by its invasion had violated several treaties and conventions to which it was a party. A similar resolution was discussed in the United Nations Security Council and although receiving widespread support it was ultimately vetoed by the United States. President of the United States Ronald Reagan, when asked if he was concerned by the lopsided 108–9 vote in the UN General Assembly said "it didn't upset my breakfast at all." When she telephoned Reagan twenty minutes later, he assured Thatcher that an invasion was not contemplated. Reagan later said, "She was very adamant and continued to insist that we cancel our landings on Grenada. I couldn't tell her that it had already begun." Following the U.S. victory, Scoon assumed power as interim head of government. He formed an advisory council which named Nicholas Brathwaite as interim prime minister pending new elections. Democratic elections held in December 1984 were won by the Grenada National Party and a government was formed led by Prime Minister Herbert Blaize. The invasion showed problems with the U.S. government's "information apparatus," which Time described as still being in "some disarray" three weeks after the invasion. For example, the U.S. State Department falsely claimed that a mass grave had been discovered that held 100 bodies of islanders who had been killed by Communist forces. Major General Norman Schwarzkopf, deputy commander of the invasion force, said that 160 Grenadian soldiers and 71 Cubans had been killed during the invasion; the Pentagon had given a much lower count of 59 Cuban and Grenadian deaths. Ronald H. Cole's report for the Joint Chiefs of Staff showed an even lower count. Also of concern were the problems that the invasion showed with the military. There was a lack of intelligence about Grenada, which exacerbated the difficulties faced by the quickly assembled invasion force. For example, it was not known that the students were actually at two different campuses and there was a thirty-hour delay in reaching students at the second campus. Maps provided to soldiers on the ground were tourist maps on which military grid reference lines were drawn by hand to report locations of units and request artillery and aircraft fire support. They also did not show topography and were not marked with crucial positions. U.S. Navy ships providing naval gunfire and U.S. Marine, U.S. Air Force and navy fighter/bomber support aircraft providing close air support mistakenly fired upon and killed U.S. ground forces due to differences in maps and location coordinates, data, and methods of calling for fire support. Communications between services were also noted as not being compatible and hindered the coordination of operations. The landing strip was drawn-in by hand on the map given to some members of the invasion force. A heavily fictionalized account of the invasion from a U.S. military perspective is shown in the 1986 Clint Eastwood motion picture Heartbreak Ridge, in which marines replaced the actual roles of army units due to the movie's portrayal of several incompetent officers and NCOs for which the army opted out its military support of the movie. Analysis by the U.S. Department of Defense showed a need for improved communications and coordination between the branches of the U.S. forces. U.S. Congressional investigations of many of the reported problems resulted in the most important legislative change affecting the U.S. military organization, doctrine, career progression, and operating procedures since the end of World War II – the Goldwater-Nichols Department of Defense Reorganization Act of 1986 (Pub. L.99–433). The Goldwater-Nichols Act reworked the command structure of the United States military, thereby making the most sweeping changes to the United States Department of Defense since the department was established in the National Security Act of 1947. It increased the powers of the Chairman of the Joint Chiefs of Staff and created the concept of a truly unified joint U.S. forces (i.e., Army, Air Force, Marines, and Navy forces organized under one command). One of the first reorganizations resulting from both the Department of Defense analysis and the legislation was the formation of the U.S. Special Operations Command in 1987. October 25 is a national holiday in Grenada, called Thanksgiving Day, to commemorate the invasion. St. George's University built a monument on its True Blue Campus to memorialize the U.S. servicemen killed during the invasion, and marks the day with an annual memorial ceremony. In 2008, the Government of Grenada announced a move to build a monument to honour the Cubans killed during the invasion. At the time of the announcement the Cuban and Grenadian government are still seeking to locate a suitable site for the monument. On 29 May 2009 the Point Salines International Airport was officially renamed in honour of the slain pre-coup leader Maurice Bishop by the Government of Grenada. ↑ 2.0 2.1 2.2 2.3 2.4 2.5 2.6 2.7 Cole, Ronald (1997). "Operation Urgent Fury: The Planning and Execution of Joint Operations in Grenada". http://www.dtic.mil/doctrine/doctrine/history/urgfury.pdf. Retrieved 9 November 2006. ↑ 5.0 5.1 5.2 5.3 5.4 5.5 Magnuson, Ed (21 November 1983). "Getting Back to Normal". http://www.time.com/time/magazine/article/0,9171,926318-1,00.html. ↑ Steven F. Hayward. The Age of Reagan: The Conservative Counterrevolution: 1980–1989. Crown Forum. ISBN 1-4000-5357-9. ↑ 7.0 7.1 "United Nations General Assembly resolution 38/7, page 19". United Nations. 2 November 1983. http://www.un.org/depts/dhl/resguide/r38.htm. ↑ Tessler, Ray (19 August 1991). "Gulf War Medals Stir Up Old Resentment". p. 2. http://articles.latimes.com/1991-08-19/local/me-555_1_gulf-war. Retrieved 30 June 2013. ↑ "Overdecorated". 9 April 1984. http://www.time.com/time/magazine/article/0,9171,952382,00.html. ↑ 10.0 10.1 "St. Vincent's Prime Minister to officiate at renaming of Grenada international airport". Caribbean Net News newspaper. 26 May 2009. http://www.caribbeannetnews.com/news-16694--32-32--.html. ↑ 11.0 11.1 "BISHOP'S HONOUR: Grenada airport renamed after ex-PM". Caribbean News Agency (CANA). 30 May 2009. http://www.cananews.net/news/131/ARTICLE/38264/2009-05-30.html. ↑ Martin, Douglas (2013-09-09). "Paul Scoon, Who Invited Grenada Invaders, Dies at 78". The New York Times. http://www.nytimes.com/2013/09/09/world/americas/paul-scoon-who-invited-grenada-invaders-dies-at-78.html. ↑ "United Nations General Assembly resolution 38/7". United Nations. 2 November 1983. Archived from the original on 2000-11-19. http://web.archive.org/web/20001119041100/http://www.un.org/Depts/dhl/res/resa38.htm. ↑ "Assembly calls for cessation of "armed intervention" in Grenada". UN Chronicle. 1984. http://findarticles.com/p/articles/mi_m1309/is_v21/ai_3073305. ↑ Peter Collier, David Horowitz (January 1987). "Another "Low Dishonest Decade" on the Left". Commentary. ↑ Gailey, Phil; Warren Weaver Jr. (26 March 1983). "Grenada". New York Times. http://select.nytimes.com/gst/abstract.html?res=F30C12F6385D0C758EDDAA0894DB484D81&scp=20&sq=grenada&st=nyt. Retrieved 11 March 2008. ↑ Carter, Gercine (26 September 2010). "Ex-airport boss recalls Cubana crash". http://www.nationnews.com/index.php/articles/view/ex-airport-boss-recalls-cubana-crash/. Retrieved 16 October 2011. ↑ Woodward, Bob (1987). Veil: The Secret Wars of the CIA 1981–1987. Simon & Schuster. ↑ Zunes, Stephen (October 2003). "The U.S. Invasion of Grenada: A Twenty Year Retrospective". Foreign Policy in Focus. http://www.globalpolicy.org/empire/history/2003/10grenada.htm. ↑ "Reagan: Vote loss in U.N. 'didn't upset my breakfast'". The Spokesman-Review. 4 November 1983. http://news.google.com/newspapers?nid=1314&dat=19831104&id=uDcSAAAAIBAJ&sjid=6O4DAAAAIBAJ&pg=5592,2048008. Retrieved 30 June 2013. ↑ "Thatcher letter to Reagan ("deeply disturbed" at U.S. plans) [memoirs extract"]. Margaret Thatcher Foundation. 25 October 1983. http://www.margaretthatcher.org/commentary/displaydocument.asp?docid=109427. Retrieved 25 October 2008. ↑ 32.0 32.1 Spector, Ronald (1987). "U.S. Marines in Grenada 1983". http://www.marines.mil/Portals/59/Publications/U.S.%20Marines%20in%20Grenada%201983%20%20PCN%2019000309700.pdf. Stewart, Richard W.. Operation Urgent Fury: The Invasion of Grenada, October 1983. United States Army Center of Military History. CMH Pub 70–114–1. http://www.history.army.mil/html/books/grenada/index.html. Wikimedia Commons has media related to Operation Urgent Fury. Grenada – a 1984 comic book about the invasion written by the CIA.